Little People. In and out, in and out - that's what dump trucks are all about! 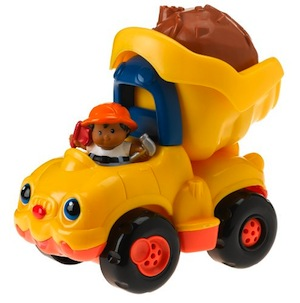 Kids will have heaps of fun loading and unloading "dirt" with this Lil' Movers Dump Truck. They'll also discover how to "make things happen," like fun sounds and wiggly-wobbly action. Truck comes with a song that will help them learn about the "ins" and "outs" on how a real dump truck works. Includes truck, driver and pretend dirt.